In ancient West Africa, kings were known to bring male craftsmen to their court for purposes of creating masterpieces of adornments, beaded clothing, as well as bead embroidered regalia. These beaded objects were created in varying shapes, color schemes and also came in a variety of beaded designs. Some of the most spectacular beaded objects in Africa came from the crowns of the Yoruba kings of Nigeria. These crowns were worn by the rulers of the Yoruba people with veils during state occasions and other public functions. The crown design was of a basket frame in a cone shape over which the craftsman stretched starched cotton. Faces were then formed from starched cotton and beaded bird figures attached. Thereafter the entire crown surface would be decorated using beads of contrasting colors. The final touch comprised of attaching a veil made from beaded strands for purposes of shrouding the king’s face. 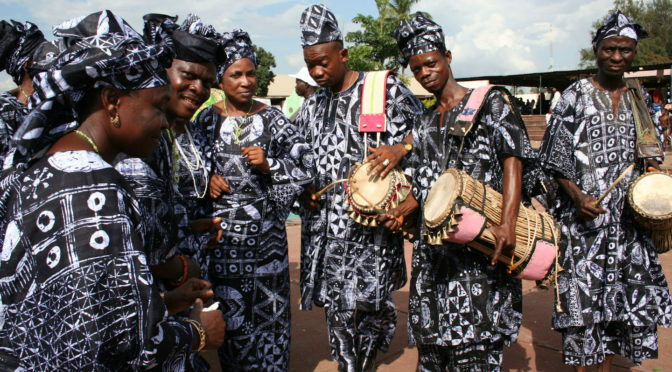 According to the ancient traditions of the Yoruba people, strands of beads were regarded as emblems of the gods. As such, when a ruler wears a beaded crown with a veil attached, this is the most effective sign of their kingship. The faces on the crown are representative of the ancestors, one of whom is likely to be Oduduwa who legend has it was the founder of the Yoruba. Birds are represented as gathering on the crown which symbolizes the spirit world and the ability of the king to mediate between the realms of the spirits and that of humans.